Most of us have known someone like Dan Landsman (Jack Black): a Type A personality whose most salient trait is that he's unbearable to be around. Dictatorial and self-absorbed, he is obsessed with being the most important person in the room. Although one of his needs is to be liked and respected by everyone, his abrasive personality makes such a thing difficult. His outward bravado is hiding a deep-rooted sense of insecurity which can choose the most awkward moments to emerge. It's possible we have also known an Oliver Lawless (James Marsden) or two: popular high school studs whose glory days have faded into dim and distant memories. They avoid reunions because they're afraid of displaying how little they have done with their lives. Or they crave reunions because such events give them a chance to reconnect with people who once adored and worshipped them. Their lives and deeds are always spoken about in the past tense because the present is unappealing and the future no less bleak. 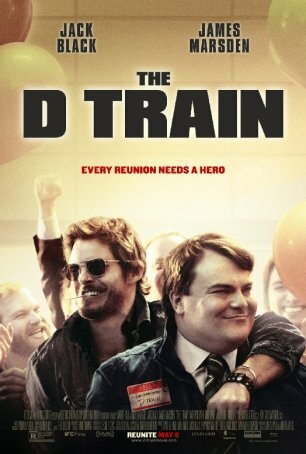 The D Train brings together Dan and Oliver and the unhealthy relationship they form fills needs neither was previously aware of. Dan is a member of the committee organizing his Pittsburgh-area 20-year high school reunion. Outside of Dan's family - long-suffering wife Stacey (Kathryn) and awkward son Zach (Russell Posner) - it's possible the only person who likes him is his boss, Bill Shurmur (Jeffrey Tambor). Everyone else tolerates him when necessary and otherwise avoids him. Dan is aware of this but does his best to shake it off. When RSVPs to the reunion begin trending mostly negative, Dan comes up with a scheme to turn things around: prey on people's fascination with celebrity. After seeing former classmate Oliver in a TV commercial, Dan becomes obsessed with getting Oliver to attend the reunion. He concocts a scheme that will allow him to take a "business trip" to L.A., lies to his boss and wife, and spends an inordinate amount of time and effort contriving to meet Oliver. With his blinders on, Dan fails to see Oliver for what he is and, although his trip is technically a success, it comes with an abundance of unintended consequences. Andrew Mogel and Jarrad Paul, making their directorial debut, manage the difficult task of keeping the audience engaged even though both of the main characters are unlikable. Dan and Oliver's familiarity is striking and, even though some of their behavior seems extreme, it's not hard to accept given the circumstances. There are a lot of 30-something burnouts who peaked in high school and just as many hard-driven social pariahs whose every attempt to ingratiate backfires. It's fascinating to consider that, 20 years later, Dan is still fixated on using Oliver's "friendship" for self-validation. For Oliver, things aren't more complicated - Dan's massaging of his ego allows him to believe he's more than an addict and a failure. This is a dark comedy; the tone is such that it benefits from Jack Black emphasizing the less appealing aspects of his personality. His portrayal of Dan is spot-on - he gets the character and delivers someone who is repugnant yet, at the same time, strangely sympathetic. Dan has deep psychological problems that manifest themselves in the way he reacts to and interacts with Oliver. James Marsden, appearing in his second recent film about a disturbed main character (the other being Welcome to Me) channels a stoned James Franco in building a very un-Marsden-like individual. Of the secondary characters, Jeffrey Tambor deserves praise for his ability to be both funny and poignant at the same time. Mogel and Paul reach for a more ambitious scope than the movie can contain. They throw a lot of elements into the mix, including questions about sexual identity, what constitutes good parenting, and how people reconcile past with present. It's possible to argue that neither Dan nor Oliver (Dan in particular) "earns" the ending and that at least two subplots are resolved too hastily and with too few consequences. Overall, however, The D Train is a darkly humorous look at a disagreeable character and will appeal to those who don't mind movies that venture into unsettling territory to make points and elicit laughter.